This essay was originally post on Ecorazzi.com. A troll appeared and posted a number of problematic messages. 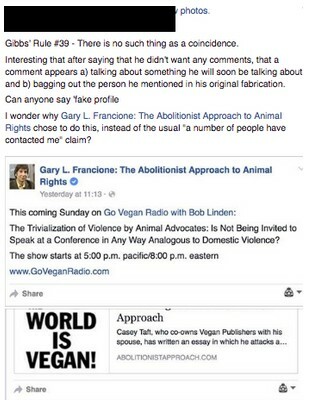 The matter was reported to Ecorazzi and they removed the post for the time being until they return from the Chicago Vegan Food and Drink Festival. In the interim, the essay is available here. Let me open this letter by stating that I’m one of you. It took too many years for me to understand the concept of justice as it related to both others and myself, but now I’m one of you. So while I address this letter to you it’s not a blanket condemnation of those of you who identify as such. It is, instead, a plea to those of you who’ve let me down to do better in the future. I’m going to be upfront and tell you that Judith Woolf isn’t my real name. I can’t tell you what my real name is and I can’t tell you details of what I endured because I’m still afraid of him…so afraid that I can’t even say his name. I survived domestic abuse. I won’t claim that I escaped, because I still live with it every day: the fear, self-hatred, doubting and questioning. What I’ve gone through is so deeply a part of me that at times I forget where it ends and I begin. And I haven’t yet begun; I mostly still see myself through his gaslighting and contempt; I don’t yet know who I am, and most of the time I hate the version of me that he tried to make me believe existed. But that’s another story that will probably never be told. What I want to know is where you were when I needed you. Where were you when Vegan Publishers posted an essay comparing being uninvited from a conference or unfriended on Facebook to domestic violence? Where were you when I asked for my story and those of others like me not to be reduced to a comparison with a mere Facebook spat? Did you forget about me and others like me when you circulated this comparison online to score points against people you don’t like…at any cost? Did you think about me, a survivor, when I explained what psychological abuse looks like (and how much it differs from personal grievances), or did you instead prefer to defer to the words of an “internationally recognized researcher in the area of violence and abuse prevention”? You speak of the value of lived experience. Well instead of heeding mine you gave voice to an academically privileged white man despite repeatedly asking such men to stay in their lanes. Why wasn’t I heard? Is it because lived experience only matters to you when it fits with the story you want to promote, when it’s “testimony” about the perceived harms caused by those you paint as your enemy? Why didn’t you come to my defence when someone with claimed that my profile was a sockpuppet account for Gary L. Francione? By failing to amplify my voice and by failing to defend me when I was accused of not being a real person you erased the experiences of so many other women like me. We don’t exist for you, it seems, when we’re more useful to ignore…when we disrupt your narratives about who the “baddies” are. Because we don’t sing from your hymn sheet, we don’t count. Dear Vegan Feminists, you’ve let me down. I’ve gone it alone for too many years now and I know what isolation is like (the one I survived made sure of that), so you can’t harm me any more than I’ve already been harmed. I’m writing this because there are others. Some are struggling to find a way out and some don’t even know that what’s happening to them is abuse because they don’t have a sense of their own personhood. And every time you allow someone to turn our experiences into cannon fodder, or every time you close your ears to our voices when we’re pleading to be heard, every time stories of domestic abuse become battlefields for your pseudo-intellectual struggles, you force us to lose all over again. Dear Vegan Feminists, listen. Our lives are not pawns in your games. Our stories aren’t weapons. Our experiences matter because we lived them. Our personhood has been denied once; don’t put us through that again.